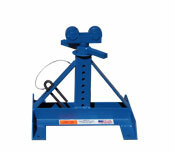 We invite you to explore MIDCO's product line of quality Pipe Jacks. Available in five different types of stands, choice of seven different pipe jack heads styles, we are sure you will quickly discover one(s) ideally suited for your jobsite needs. Standard Features : Sturdy all steel construction. Drop Stop™ Hand Protector. All parts are interchangeable. Depending on the Pipe Jack/Head style you select, will support up to 2,500 lbs. Select from the following MIDCO Pipe Jack categories. The Drop Stop™ safety feature creates 1" safety zone while releasing the lock washer, keeping the pipe jack head from causing hand inquiries when the lock washer is released. The Midco Master Jack has a large 21" vee head with a heavy duty 5-legged stand design the offer a maximum margin of safety for use on pipe up to a 36" diameter. Pipe use to 2,500 lbs. Can be wheeled with ease, saving on lifting and handling. Great for leveling loads during fit up also. MM-1851 w/Vee Head & Casters 2,500 lbs. All steel construction with rugged design for job site use. 1 1/2" acme screw for easy adjustment and an oil lite brass busghing so no greasing needed. MM-1961 Reel Jack 26" to 56" 2,500 lbs. MM-1971 Reel Jack 46" to 96" 2,500 lbs. Durable all steel construction, formed steel legs and choice of seven pipe head styles. Available in two sizes Journeyman Hi Jacks and Journeyman Lo Jacks. Sturdy all steel construction, steel pipe legs and fully interchangeable parts. Available in two sizes Heavy Duty Lo Jacks and Heavy Duty Hi Jacks. Fold up legs, Easy to carry, fit in toolbox or truck. Head Lock prevents pipe jack head from sliding free from ID tube. Available seven head styles. All MIDCO pipe jack heads come with an Acme-threaded shaft (except for the Bar Stock Head) for precision height adjustment.